Lounging on the beach is an excellent thing to do, especially when visiting Florida, but the Sunshine State has a lot more to offer than just tanning opportunities. Rich with history, Florida is a treasure trove for those looking to learn a little something while away from home. And a great way to see a piece of that history is to pay a visit to Florida’s tallest lighthouse, the Ponce De Leon Inlet Lighthouse. Originally built in 1883, The Ponce De Leon Inlet Lighthouse stands at dizzying 175 feet tall (that’s about 203 steps to the top). Not only will you get some exercise, but you will receive one of the best views in Florida after your trek. 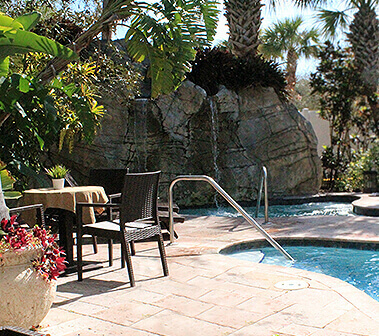 The outlook offers stunning views of the Atlantic Ocean, inlet, and inland waterways. If you think you’re done after finishing your climb, think again. The lighthouse has many other offerings to explore such as the lighthouse keeper’s dwelling, the oil house, lens museum, radio and generator room, and the opportunity to explore a piece of nature with the coastal hammock. The lighthouse museum also offers two specialty tours: the Climb with the Keeper tour and Climb to the Moon tour. Be sure to check available dates and times for these tours because they go quick and reservations are required. General admission is $6.95 for adults and $1.95 for children while the special tours are $25 per person (check for coupons on their website). Once you have finished your day at the lighthouse, head back to The Riverview Hotel and get a massage or relaxing spa treatment; you’ll probably need one after climbing all the way to the top of the lighthouse!